TERMS: Net 30 days on open account only. Monthly statements issued on the first of each month for previous month's purchases. In cases of persistent late pay, a service charge of 1.5% monthly will be added upon the unpaid balance and will appear on the following statement. Accounts 60 days past due will be closed immediately until brought current and will be up for review by American Universal Corporation. SAMPLE POLICY: American Universal will supply our distributors/dealers with a complete set of our sample boards for a cost of $300, plus freight expense. Full sheet sample orders will be subject to a special sample discount rate of 40% + 30%. No less than full sheet orders will be taken. All sample orders are subject to our approval and availability. PACKING CHARGES: For small orders shipped via U.P.S., or any package express, there will be a minimum charge of $5.00 for packing and handling. American Universal Corporation will not be responsible for loss or breakage on these shipments. Claims must be filed directly with the freight company involved. SHIPMENTS: All L.T.L. truck shipments are shipped FREIGHT COLLECT unless authorized by American Universal Corporation. All truck line carriers are selected by customer. RETURN POLICY: All returns must be authorized by American Universal Corporation. Material must be returned within FIVE working days of the invoice date. Material MUST be accompanied by the original invoice or its copy. NO returns will be accepted without paperwork. Returned material must be clean and in re-sellable condition. No broken tile or sheets will be credited or accepted. All returned material is subject to a 25% restock and handling charge unless other arrangements have been made. If procedure is followed, credits will be issued promptly. SPECIAL ORDERS: All speical orders are NON-RETURNABLE AND NON-CANCELLABLE. On container orders, a cash deposit, letter of credit and purchase order are required. All orders are accepted subject to our ability to deliver at the time and in the quantities specified, contingent upon strikes, floods, fires, accidents, natural disasters, labor and material shortages and other causes beyond our control. Prices are to be of the current published list unless otherwise noted. 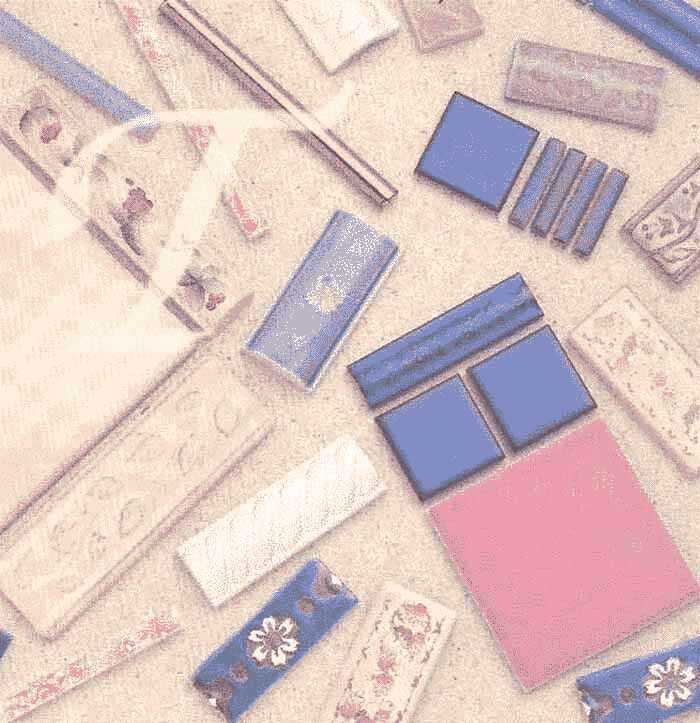 SHADE VARIATION: Because variations in shade are inherent in all fired clay products, any claims of such variation must be made within FIVE days after reciept of goods. We cannot guarantee shade or color from lot to lot or carton to carton. Samples are not always indicative of current stock material. American Universal Corporation will not be responsible for any claims if the tile fails to match re-production of colors lines in literature, color charts, advertisements or samples. BUYERS RESPONSIBILITY: It is the buyers responsibility to inspect ALL tile BEFORE beginning installation, and if for any reason the material is determined to be defective or unacceptable, the buyer will notify American Universal Corporation BEFORE INSTALLATION. American Universal Corporation will not be responsible or recognize any claims made after the start of installation, or for any tiles said to be incorrectly sized, shaded, packaged mounted, or not matching prior shipments. CLOSEOUT MATERIAL: All sales of closeout merchandise will be given special discount pricing. All merchandise will be sold on an "as is" basis and NO returns, exchanges or credits will be allowed.